The European EU-LIVE consortium has revealed a new electrified mobility solution for the L5e category – a segment in-between two and four wheels with speeds of more than 30mph. The plug-in hybrid vehicle is equipped with two electric in-wheel motors (developed by Elaphe and Brembo) and a petrol internal combustion engine. Maximum zero-emissions speed is up to 43mph (70km/h) thanks to its 48V battery, supplied by Samsung SDI, while speeds beyond this (up to 80mph (130km/h)) initiate a Peugeot Scooter 41bhp (31kW) single cylinder petrol engine. Total range is slated as 186 miles (300 kilometres). The vehicle also features a tilting mechanism and hydropneumatic suspension that enhance handling, according to the vehicle’s maker. The tiny vehicle’s footprint of just 2.4 metres x 0.85 metres and rotating doors are said to aid ease of parking and free up road space. 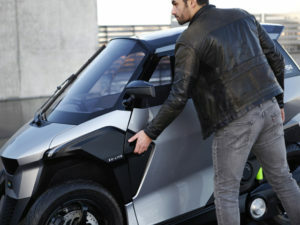 Unlike Renault’s Twizy, the vehicle also has an enclosed and heated interior. “This new electrified light vehicle allows an individual, safe and sustainable mobility thanks to its zero-emission mode,” said Carla Gohin, senior vice president, Research and Advanced Engineering. Previous: Brighton & Hove Buses go electric with Kangoo Z.E.